These humorous cards are common practice among the ROMEOs, as they tend to really celebrate when one of their members has a birthday; and especially a significant one, like the recent gathering for Allan “Doc” Dimon’s 100-year milestone. 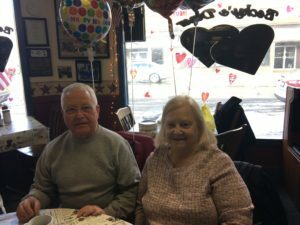 Over a dozen members of the ROMEOs gathered for Dimon’s birthday on Tuesday at Becky’s Diner, although his birthday was officially on Monday, Feb. 5. But there was one thing missing from the party, Doc Dimon. 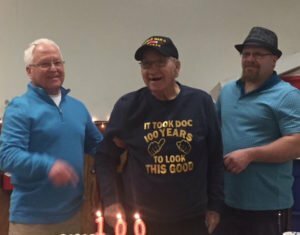 The former optometrist and World War II veteran had a busy weekend of celebrations, and decided to sit out on Tuesday’s party. But that didn’t stop the Romeos from celebrating anyhow, which they did on Tuesday at Becky’s Diner in Waverly, N.Y.
With birthday cake prepared for the celebration, and a hand full of retired old men that stood ready with birthday cards, they honored one of the group’s founding members, despite his absence. 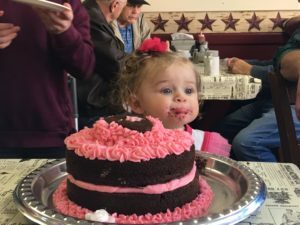 To make up for things, however, one-year-old Gabriella Young decided to enjoy a smaller cake that had been prepared on Tuesday, and offered a contrast in age – from one, to 100. Also at Tuesday’s celebration was Doc’s grandson, Justin Peters, along with Doc’s great-granddaughters, Ella and Xav. 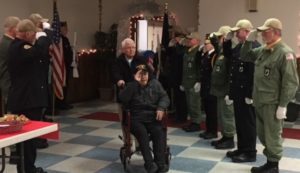 Previous celebrations, such as a Saturday gathering that included an honor guard and a salute to Waverly’s oldest World War II veteran, took place at the Sayre VFW. 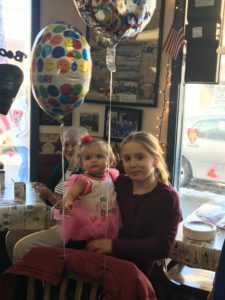 According to Dimon’s sister, Linda Dimon, who was in attendance at Becky’s Diner on Tuesday, the VFW provided a 12-member honor guard, and approximately 100 guests attended Saturday’s celebration. 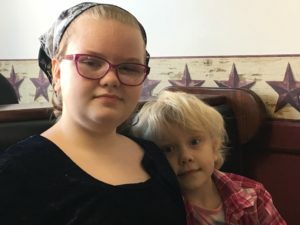 A good friend, and former patient of Doc’s, Kathy Clarke, stated that Dimon was a bit tired from all of the birthday celebrations, and that he wasn’t feeling well for Tuesday’s gathering. 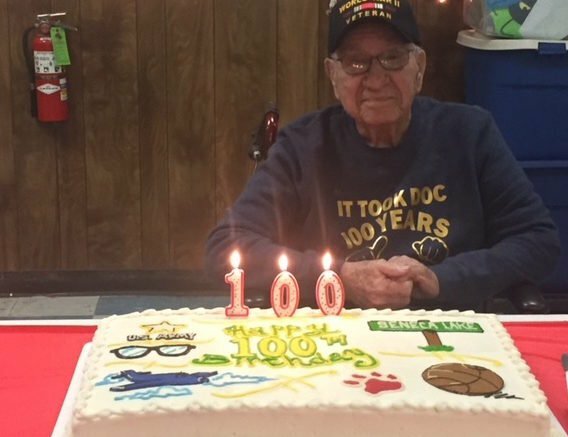 But the best news, according to Clarke and others, is that Doc made it to 100. A humble man, Dimon was also recognized throughout the week for his service during World War II where he shared his medical experience, and for his contributions to the community. 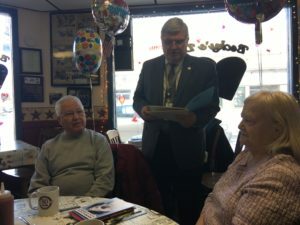 John Holton, Sr., director of Tioga County’s Veterans Service Agency, attended Tuesday’s gathering at Becky’s Diner to present a proclamation signed by Martha Sauerbrey, chair of the Tioga County Legislature. Within the proclamation, his military service was highlighted as well as his optometry practice in the Valley, and his Waverly Rotary Club membership. In fact, Dimon was a recipient of Rotary International’s highest honor – a Paul Harris Fellow. Dimon was also a long time member of Waverly’s American Legion and the Sayre VFW, where he served as Commander in 1980. Dimon also volunteered his time to the Salvation Army, Waverly Central School District, BOCES, Tioga General Hospital and Robert Packer Hospital, and is the oldest life member and oldest living member of the Waverly Methodist Church. But the accolades didn’t end there. Dimon also received a Congressional Record from the House of Representatives, a Senate Proclamation signed by Senator Fred Akshar and Assemblyman Christopher Friend, a plaque from Waverly Rotary, and a Proclamation signed by Waverly Mayor Patrick Ayres that designated Allan “Doc” Dimon Day in the Village of Waverly. And despite his absence from Tuesday’s gathering, physically, his youthful spirit was there. The young patron mentioned earlier, Gabriella Young was celebrating her first birthday and decided to join in on the festivities. Dimon’s son, Craig, was also inducted as a ROMEO following the birthday celebration, allowing him to some day fill the big shoes of the community’s beloved Doc Dimon. Although tough shoes to fill, Craig Dimon can only hope that he’ll be receiving a 100-year-old birthday greeting, as his father did, from the tight-knit ROMEOs. Be the first to comment on "Doc Dimon joins the century club; age wise, that is"